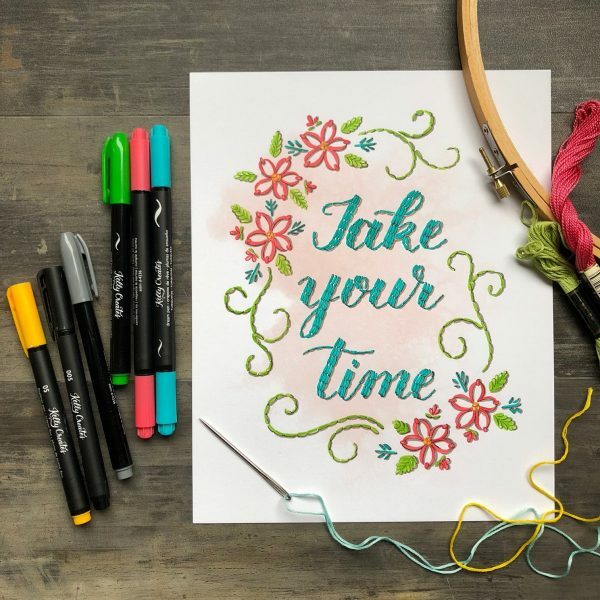 Get ready to be BLOWN AWAY by Bonnie Peters’ tutorial on creating calligraphy that looks like embroidery, using my new Kelly Creates Quote Pad “The Beauty of Lettering.” You can use this Quote Pad to trace and learn, and then frame these 8×10 pieces and use them as your own home decor or give them as gifts. I used one the pre-printed quotes from the lettering pad, Take Your Time, which is the perfect phrase for this technique since it does take a little time. You may, however, be surprised how quickly it goes and how relaxing it is, once you’ve tried it for yourself. Using the Turquoise Dream Pen, I drew multiple strokes to make them appear as if they were embroidery stitches, to fill in the entire white space of each letter. After those letters were all filled in, I used the Kelly Creates .005 black Fineliner and drew thin lines on the right sides of each stroke. This helps create some dimension, as if each brush stroke were an embroidered stitch. To create even more shadow dimension, I used the Grey Small Brush Pen from the Kelly Creates Multicolor Small Brush pen set and created a bumpy drop shadow along each ‘stitched’ letter. It helps to make these lines slightly curved as they follow each stitch. Again, this assists in giving the appearance of fabric buckling under the faux stitches. I pencil sketched in some simple flowers, leaves, and buds to frame the quote. You can look at some real embroidered pieces for more inspiration to help you make some appropriate stitch variations with your pens. You would then repeat the same stitching technique as the letters. 1. Choose your colour for each stitch 2. Use the black fineliner, to create the stitches’ shadow lines. 3. With the grey brush pen, add more shadows to the letters. Remember to keep all your shadows on the same side of both your letters and your florals. An easy tip is to draw a little sun in one corner of your paper piece, and know that the shadow will appear on the opposite side of the sun shining. After the florals were finished, I decided that the design needed some flourishes to fill it in a bit more. So I penciled in a few and matched the flourishes to the green leaves by drawing stitches with the same Sage & Grey Small brush pens, plus black fineliners. Stage it with some real embroidery supplies and see who you can fool. I totally thought this was embroidery! Didn’t you? WOW! Bonnie, this is such a fantastic and innovative way to use The Beauty of Lettering Quote Pad. I would definitely frame this…but I would keep it for myself! SUPPLIES: Click on these images and shop the affiliate links…..